Since 2006 we have offered the best stock Rating System online. Over the years it has helped thousands of investors select winning stocks while steering them away from many big losers! Strong Buy & Buy Ratings: These are the stocks you want to own. Historically they have outperformed the market. 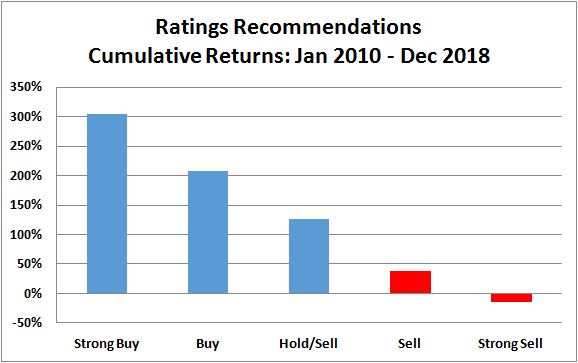 Strong Sell & Sell Ratings: AVOID THESE STOCKS! They usually underperform the market and often end up being big losers. If you started with just $10,000 at the beginning of 2010 and followed our recommendations by only investing in stocks rated as a “Strong Buy”, your $10,000 would have grown by 304% to $40,437 today! HOWEVER had you invested in the broad market or a mutual fund, you would have earned 125% and only have $22,481 in your investment account. You deserve more. Super Stock Screener’s performance speaks for its self. I like to use it as the last step in screening the stocks I buy. Super Stock Screener’s Strong Buy ratings have kept me above the fray better than any other service I have used. I started using your service after many exhausting hours of research looking for similar services. I've grown tired of so much bad fundamental analysis and overblown hype, and really just want a simple mechanical reporter of buy and sell recommendations, minus the emotion and opinion. Your service track record also speaks for itself. Super Stock Screener is one of the best and certainly the fastest evaluation of stocks available on the Internet. It is exceptionally easy to use and the information provided allows sensible investments to be made. I use it as an essential portfolio investment guide and would not do without it. I never buy a stock without checking Super Stock Screener. Thanks to your service, my portfolio has improved substantially. Hats off to your service. I will continue to use it and recommend it to my friends. It’s time to benefit from our service, risk free! Try our Ratings System and Stock Screener, and check out the current recommended holdings in our model portfolios at no risk for 30-days. If you are not 100% satisfied with these 3 services simply contact us within 30 days from the purchase date, and we’ll cancel your order before your credit card is charged. We give you this unconditional guarantee, because we are very confident about the quality of our service. If you’re not happy, we’re not happy! The best performing stock Rating System online! A world class stock screener that allows me to combine Stock Ratings with my favorite factors. Market-beating model portfolios that are consistently beating their benchmarks. The entire program now, risk free.